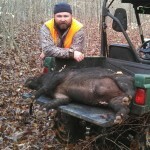 Lee Davis bagged this 185lb boar on November 8th. 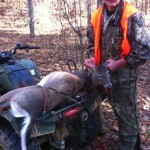 Konner Bullock got a nice doe on November 12th. 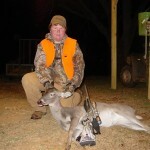 Sam Farris took a nice doe on opening morning of November 17th. Congrats Sam! Love to see these young hunters on the property. 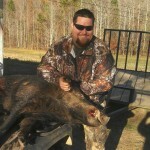 Another shot of Allen Manues with his moster 285lb boar. Does he look tickled or what? 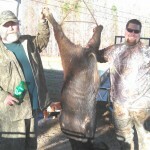 Mike Palmer (left) and Allen Manues (right) pose with a moster boar hog taken on the club on November 18th. 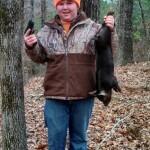 Both had encountered this big guy and Allen was finally able to take the hog down. 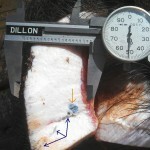 In the end, it took three shots from a 45/70 to stop the 285lb hog. 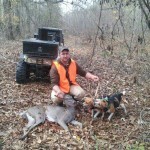 Justing Watson (AKA: Candyman) took a nice doe as the beagles pushed her across a popular crossing on Hatchie Channel. 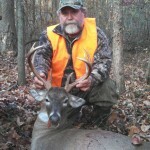 Mike Palmer bagged a real nice buck on the club on the morning of November 23rd. If you look at the Game Cam gallery, you’ll notice several pictures of this buck in full velvet posted back in September. 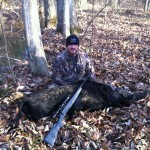 BG Floyd took another large boar off of the property this week. On-hoof weight is unknown, but the beast field dressed at 240lbs. 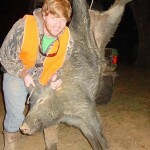 This hog may very well surpass the 285lb monster bagged by Allen Manues the week prior. 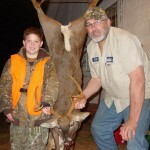 Dwight Christian and his grandson Dakota Walker pose with a very nice buck Dwight harvest on the evening of December 15th. Most folks don’t realize how tough wild hogs really are. Additionally, most do not realize the wild hogs develop a gristle plate on their shoulders/sides to protect them against other hogs over their lifetime. I took a football size piece from the boar killed by Allen Manues home to do a little ballistics test. The shoulder plate measured 1.85″ at the thickest point. I placed it on shooting berm and made sure there was not space between the piece and the dirt to truly simulate the shooting situation. I measured off 20 yards and shot the plate with a 12ga 3″ 00 Buckshot. Nine of the 13 pellets struck the plate, but the deepest any of the pellets penetrated was 1.52″. Now, that should make anyone think about not only where to place your shot, but what to shoot a hog with. Jalon Bullock took this buck on the property over the holidays. 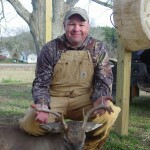 Dalton took this buck while still-hunting on the west side of the property on January 5th. 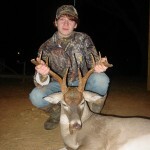 Interesting buck as we have over 100 pictures of hime over the past two years. The buck has never been seen during daytime hours and had been nicknamed “Corndog” by another member last year. Weighed in at 160lbs on the dot and had an inside spread of 17 7/8″. 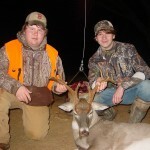 Konner Bullock (left) and Dalton Gregory (right) pose for another shot of Dalton’s buck. The boys wanted a picture together since they were still-hunting together when Dalton took the buck. Konner and I went out to dig some bait holes to hunt hogs around after deer season closes. Several sholts ran out while I was digging the last hole and Ol Quick Draw couldn’t resist! Lee Bullock bagged this boar on January 27th.